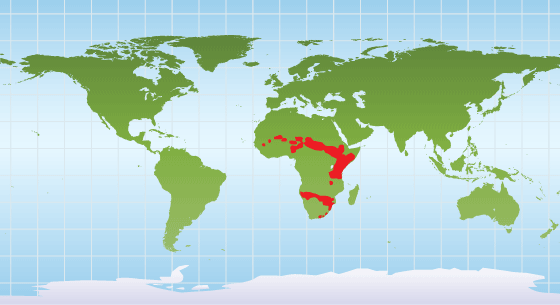 Giraffe live in the Savannas of Africa, in semi-arid, open woodlands with scattered trees and bushes. Giraffes are the world's tallest mammals with males reaching a height of up to 5.5m, females up to 4.5m. 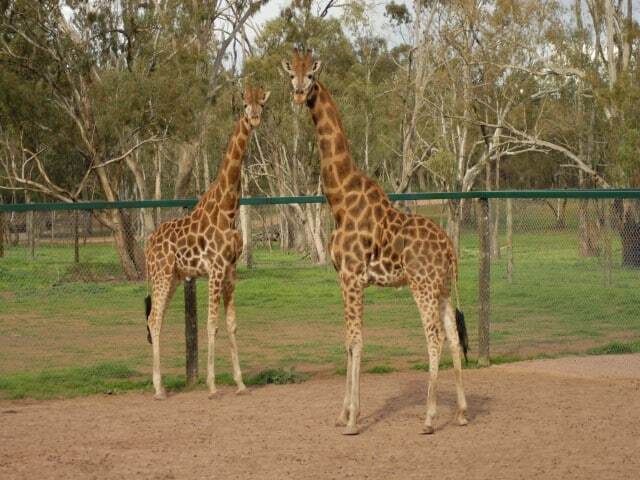 They are well known for their long necks, long legs, and spotted patterns with the background generally lighter in colour compared to the spots or patches. 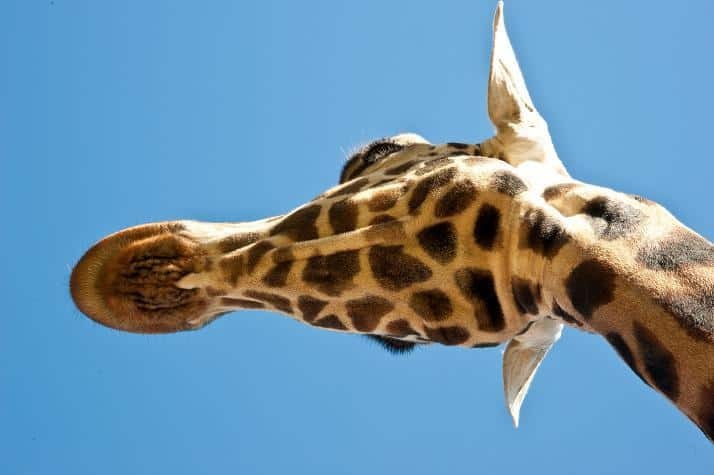 Male giraffe can weight up to1100kgs. Giraffe have small "horns" or knobs on top of their heads that grow to be about 13.5cm long and are laid back at birth. They have a short stiff mane and a long tuft of hair at the end of the tail. Also known to have a long prehensile tongue measuring up to 45cm. Giraffe have large, brown eyes, bordered by long black lashes and large, hoofed feet. • Gestation period: 15 Months. 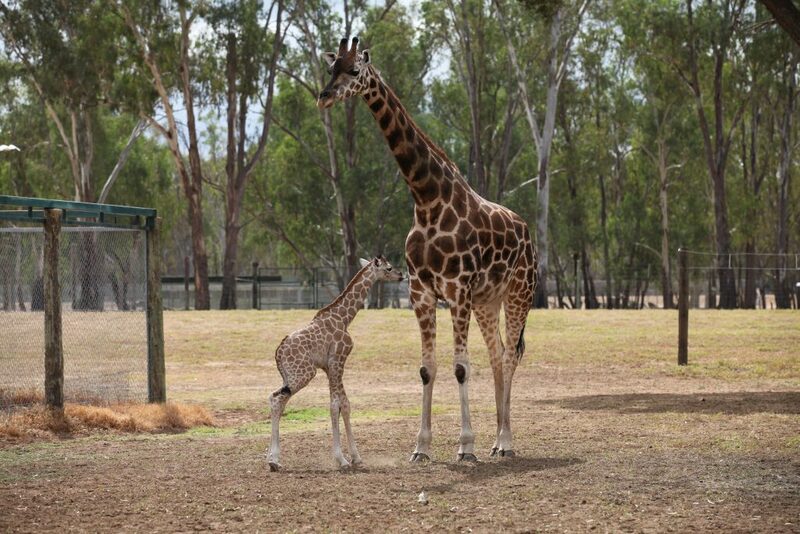 • Young per birth: One usually standing at about 1.8m tall when they are born. • Diet: Feed almost exclusively on new shoots of shrubs and trees as they are browsers. Acacia trees are by far their favourite food source, the leaves being stripped from their thorny branches with their long prehensile tongues and lips. • Giraffe have 7 neck vertebrae the same number as humans only much larger. • They only sleep for up to 5 minutes at a time and usually sleep standing up. • Every step a Giraffe takes can be up to 4.5m long. • The Giraffe is an even-toed ungulate and ambles similar to a camel with the weight on the left legs and then the right legs. • They can gallop at 60km/h when both forelimbs and both hind-limbs move together. • The Giraffe’s biggest enemy is the lion, followed by crocodiles and humans. • The Giraffe’s coat patterns are unique to each individual, similar to 6ingerprints in humans with males usually having darker coats. • Their main defence is their size, speed and a massive front hoof that can kill a lion with a single blow. • Giraffe/Giraffa comes from the Arabic word “zarafah”, which means “one who walks swiftly”. • To drink Giraffe must kneel on forelegs or spread them wide to reach the water but like the camel Giraffe can go for up to 3 days without needing to drink as they can take in up to 38lt at a time. • Closest relatives to the Giraffe are the Okapi. • Lifespan: 25 to 28 years.